It is difficult to categorize Lamia Ziadé’s graphic novel, Bye Bye Babylon, about growing up during the civil war in Lebanon, as such. It doesn’t follow a traditional form with frames and captions, but rather, is a first-person narrative with a wealth of colorful illustrations in gouache. Beirut-born artist Ziadé studied graphic arts in Paris and had worked as an illustrator, a textile designer and a painter before tackling her very personal account, some twenty years later, of the first few years of the Lebanese civil war, which began in 1975 and shuddered to a halt in 1990. Ziadé recounts these early years of war with the naiveté and innocence of the child that she was, paired with the three years of research she spent looking into the civil war, some scathing black humor to cloak the more ghastly details and a little bit of poetry in between. Ziadé, who has always had a penchant for brand design, had at first thought of creating a sort of catalogue of objects from the 1970s, freely mixing images of grenades and machine guns with Bazooka chewing gum and Nivea cream. But having discovered the political aspect of the war during her research, she decided she had more to say, adding text to her paintings of Kalashnikov-toting militia, bikini-clad women in sunglasses and Chinese vases pillaged from wealthy homes. She nimbly combines historical, military and political references with anecdotes about her family, night bombings, or stockpiling supplies during sieges. The child narrator desperately wants to understand the horrific violence all around her, but realizes that there is no “good” guy nor “bad” guy, and that most everything around her lies in a gray area. That Ziadé came from a privileged family, with an apartment in Paris to boot, and that her parents chose to remain in Lebanon resulting in her childhood being “regulated by a pattern of dreadful events”, makes the story all the more compelling. Her descriptions of the sparkling Beirut in the 1970s—with French and American products piled high in shops, cinemas, nightclubs and rooftop restaurants where one can eat hamburgers, but also the souks, the Levantine pastry shops and close family relations—are seen through the attentive eyes of the artist Ziadé would become, making these recollections all the more painful when she shows how her entire world is destroyed in a wild, hallucinatory, descent into violence within a matter of months. Bye Bye Babylon is about the universal bewilderment of civilians suddenly faced with a civil war and the particularity of Lebanon almost 40 years ago, a foot in the east and a foot in the west, an open playground for any player. Olivia Snaije is a journalist and editor based in Paris who has written extensively on the Middle East. She is contributing editor for Publishingperspectives.com and is books editor for Harper's Bazaar Art. 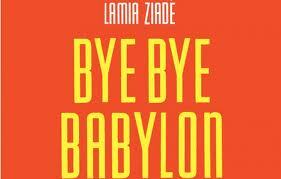 She translated Lamia Ziadé's Bye Bye Babylon into English from the original French.